Constituted 22 May 1846 in the Kentucky Militia as the 1st Kentucky Cavalry and the 2d Kentucky Volunteer Infantry. Organized from volunteers of the enrolled militia, principally from counties in central Kentucky, and mustered into Federal service 9 June 1846 at Louisville; mustered out of Federal service 7 and 9 June 1847, respectively, at New Orleans, Louisiana, and continued in state service as separate volunteer militia companies. Reorganized 15 June 1860 in the Kentucky State Guard as the Lexington Battalion, to include the Lexington Rifles (organized in 1857 by Captain John Hunt Morgan). Expanded 6 November 1860 to form the Lexington Battalion (to include the Lexington Rifles) and the Kentucky River Battalion. Elements with Union sympathy reorganized April-June 1861 primarily as the 1st and 2d Kentucky Volunteer Infantry Regiments. Mustered into Federal service 4 and 13 June 1861, respectively, at Camp Clay, Ohio; mustered out of Federal service 18 and 19 June 1864, respectively, at Covington. Elements with Confederate sympathy (less Lexington Rifles) reorganized in July 1861 as elements of the 1st Kentucky Brigade (The Orphan Brigade) and mustered into Confederate service at Camp Boone, Tennessee Surrendered 4 May 1865 at Washington, Georgia. Lexington Rifles withdrawn 20 September 1861 from the Kentucky State Guard, reorganized as a separate company of cavalry, and mustered into Confederate service at Bowling Green. Consolidated in October 1861 with two other cavalry companies and consolidated unit reorganized and redesignated as Morgan's Squadron, Kentucky Cavalry. Expanded, reorganized, and redesignated in June 1862 as the 2d Kentucky Cavalry Regiment (Morgan's Men) Surrendered 8 May 1865 near Woodstock, Georgia. Former Lexington and Kentucky River Battalions reorganized 18 May 1881 in the Kentucky State Guard as the 3d Battalion with Headquarters at Lexington. Expanded, reorganized, and redesignated in 1883 as the 2d Regiment of Infantry with Headquarters at Lexington. Mustered into Federal service 14-25 May 1898 at Lexington as the 2d Kentucky Volunteer Infantry; mustered out of Federal service 31 October 1898 at Lexington. Reorganized 24 April 1899 in the Kentucky State Guard as the 1st Regiment of Infantry with Headquarters at Lexington. Redesignated 31 July 1899 as the 2d Regiment of Infantry. (Kentucky State Guard redesignated 19 March 1912 as the Kentucky National Guard). Mustered into Federal service 25 June 1916 at Fort Thomas, Kentucky; mustered out of Federal service 15 February 1917 at Fort Thomas, Kentucky. Mustered into Federal service 21 April 1917 at Camp Stanley, Kentucky; drafted into Federal service 5 August 1917. Consolidated 1 October 1917 with the 3d Regiment of Infantry (less 3d Battalion) (see ANNEX); consolidated unit concurrently reorganized and redesignated as the 149th Infantry and assigned to the 38th Division. Demobilized in January 1919 at Camp Zachary Taylor, Kentucky. Former 2d and 3d Regiments of Infantry reorganized 1920-1921 in the Kentucky National Guard as the 1st Infantry and the 53d and 54th Machine Gun Squadrons (53d and 54th Machine Gun Squadrons - hereafter separate lineages). 1st Infantry redesignated I July 1921 as the 149th Infantry and assigned to the 38th Division (later redesignated as the 38th Infantry Division); Headquarters Federally recognized 1 July 1922 at Frankfort. (Location of Headquarters changed 13 December 1927 to Louisville). Inducted into Federal service 17 January 1941 at home stations. Inactivated 9 November 1945 at Camp Anza, California. Relieved 13 May 1946 from assignment to the 38th Infantry Division. Reorganized and Federally recognized 25 September 1946 with Headquarters at St. Matthews. 2d Battalion as the 242d Tank Battalion with Headquarters at Ashland. 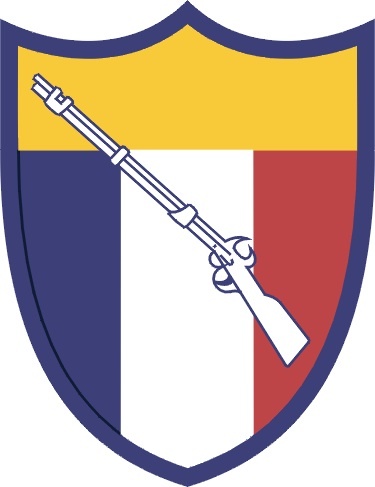 242d Tank Battalion converted and redesignated 1 October 1959 as the 201st Engineer Battalion. Organized 8 May 1882 in the Kentucky State Guard in western Kentucky as the 4th Battalion with Headquarters at Bowling Green. Expanded, reorganized, and redesignated in 1883 as the 3d Regiment of Infantry with Headquarters at Bowling Green. Mustered into Federal service 21-31 May 1898 at Lexington as the 3d Kentucky Volunteer Infantry; mustered out of Federal service 16 May 1899 at Savannah, Georgia. Reorganized 10 October 1899 in the Kentucky State Guard as the 3d Regiment of Infantry with Headquarters at Bowling Green. Mustered into Federal service 6 July 1916 at Fort Thomas, Kentucky; mustered out of Federal service 12-15 March 1917 at Fort Thomas, Kentucky. 3d Regiment of Infantry (less 3d Battalion) consolidated 1 October 1917 with the 2d Regiment of Infantry to form the 149th Infantry and assigned to the 38th Division; 3d Battalion, 3d Regiment of Infantry, concurrently reorganized and redesignated as Companies A and B, 138th Machine Gun Battalion, Company F, 113th Ammunition Train, and Company B, 113th Engineers, elements of the 38th Division. Above units demobilized in January 1919 at Camp Zachary Taylor, Kentucky. Philippine Presidential Unit Citation, Streamer embroidered 17 OCTOBER 1944 TO 4 JULY 1945. The Battalion is descended from the 4th Battalion of Infantry organized in 1882 and broken up and consolidated in 1917 to form the 149th Infantry. The design reflects the history of the 242nd Tank Battalion, the former 2nd Battalion, 149th Infantry Regiment. Mexican War service is symbolized by the cactus and snake from the Mexican flag. Civil War service is represented by the saltire. The chief is adapted from the ermine in the arms of both Brittany and Nantes, where the unit saw service in World War I.
MOTTO: "LIBERTATIS CUSTODES" (Guardians of Liberty). Design approved: 6 July 1956.